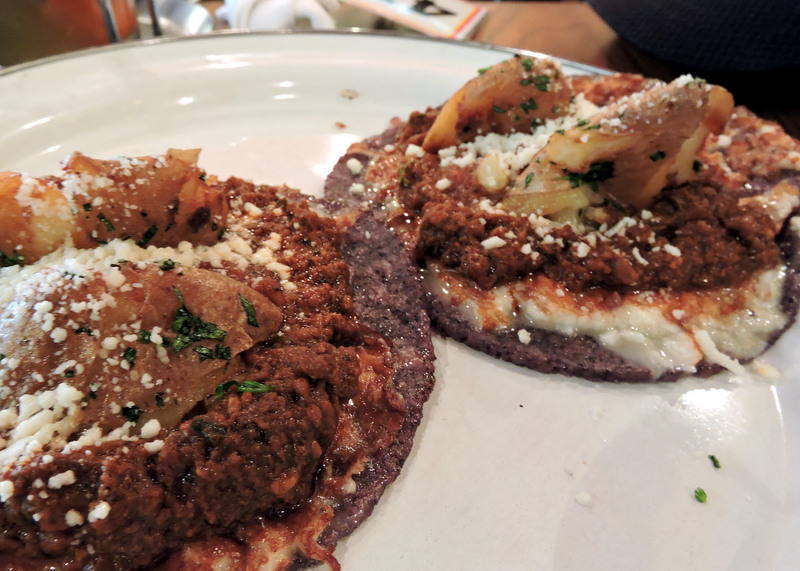 As a Canadian who moved to Los Angeles many years ago, I was delighted to discover Mexican food, and I tried most of the established restaurants around the city. These were the places that introduced generations of Americans to this unique and fascinating cuisine. 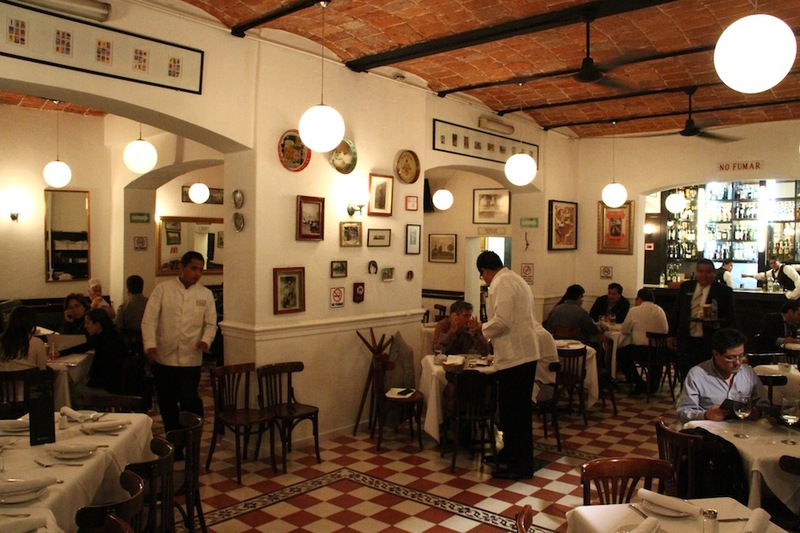 In recent years, however, I’ve been exploring some of the exciting regional cuisines of Mexico, as specialty restaurants have come on stream to serve a largely Mexican clientele. It occurred to me that I needed to revisit some of the fine, enduring places where I learned about Mexican food in the first place. My friend Sid recently invited me to lunch at his long-standing favorite restaurant, El Coyote. Sid is not a young man, but he has been coming here since he was a kid. The waiters know him by name, and he has the menu memorized. 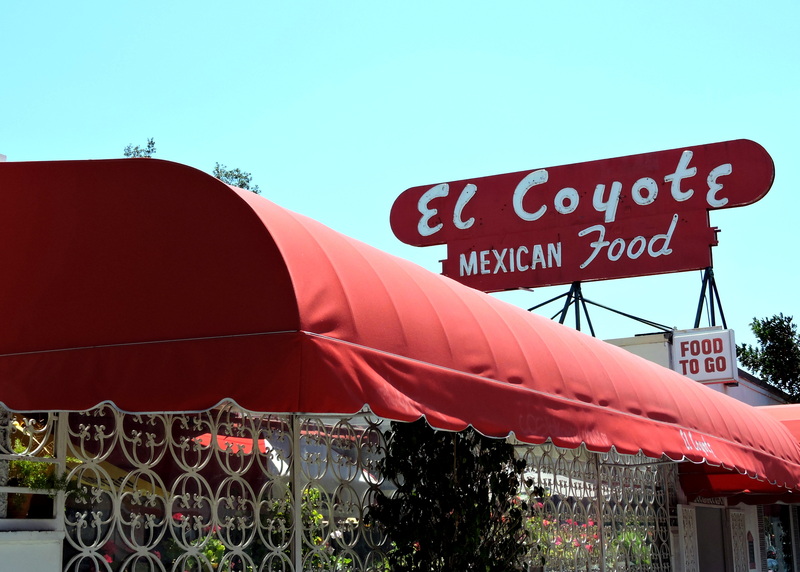 El Coyote first opened in 1931, and is going strong. 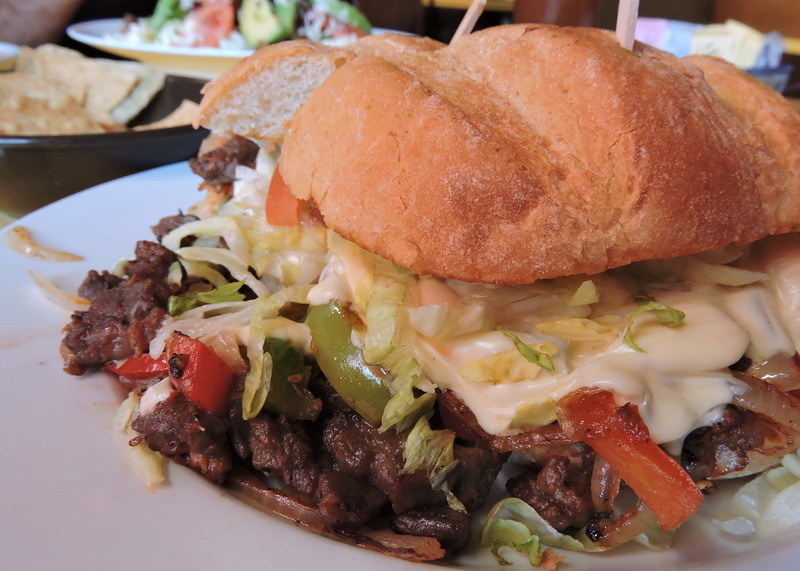 I know I should have ordered something more elaborate, but the “Torta Mexican Style Sandwich” caught my eye. 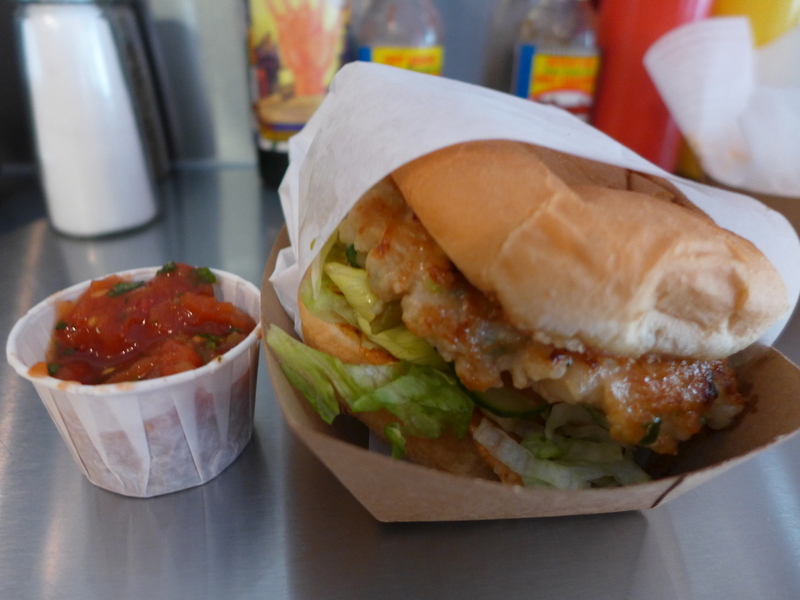 I have favorite tortas all over Los Angeles, and thought this would be a good test for El Coyote. What I got was a nice fresh roll, generously stuffed with grilled steak, red and green peppers, onion and melted white cheese. Sort of a Mexican Hoagie, the ingredients reminded me strongly of a dish called Alambre that I recently had in Mexico City… Definitely a success. Sid had the fajitas salad. Not strictly Mexican, perhaps, but it was large, and looked delicious. Everyone I know has a memory of El Cholo. “I used to go there with my grandparents” is a common memory. Others go misty-eyed thinking about the green corn tamales. I’ve had the green corn tamales, and I get it. 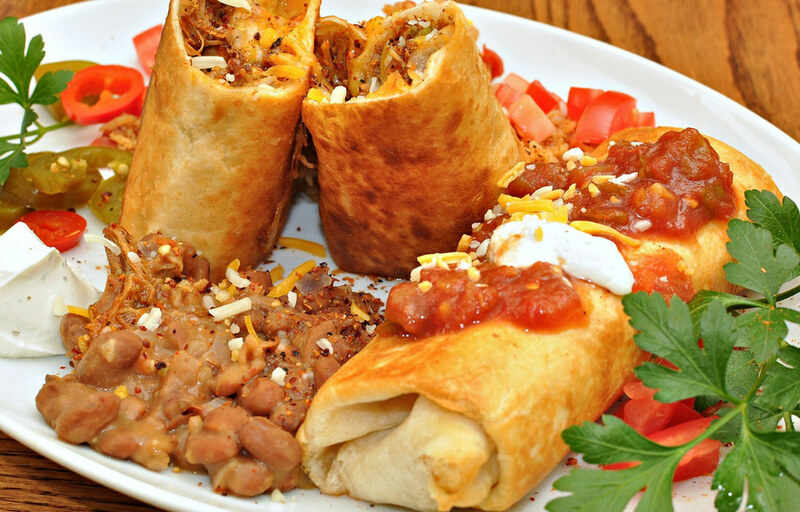 Founded in 1922, El Cholo has been around almost forever. I went to El Cholo (the original location on Western Avenue) for lunch a couple of weeks ago with my friend Leili. 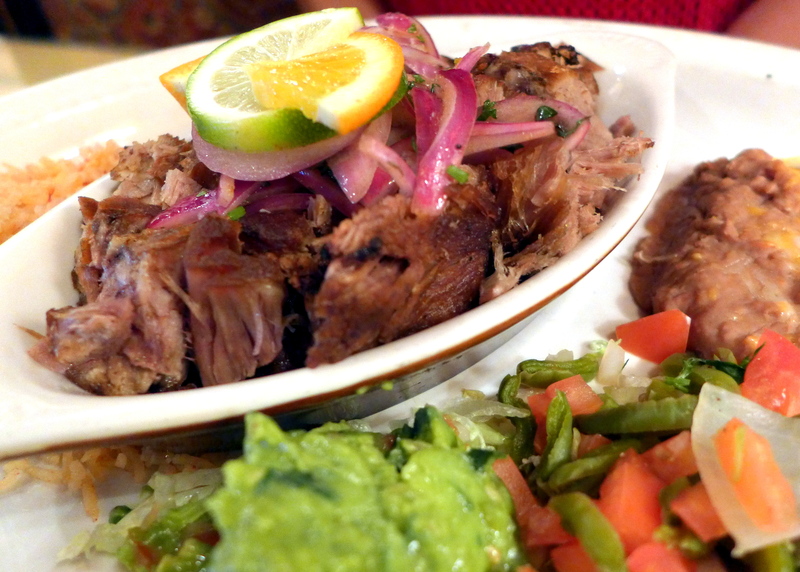 She ordered the Carnitas, a dish that first appeared on the menu in 1989, and it was a huge plate of beautifully cooked pork, served with pickled onions and sliced orange. 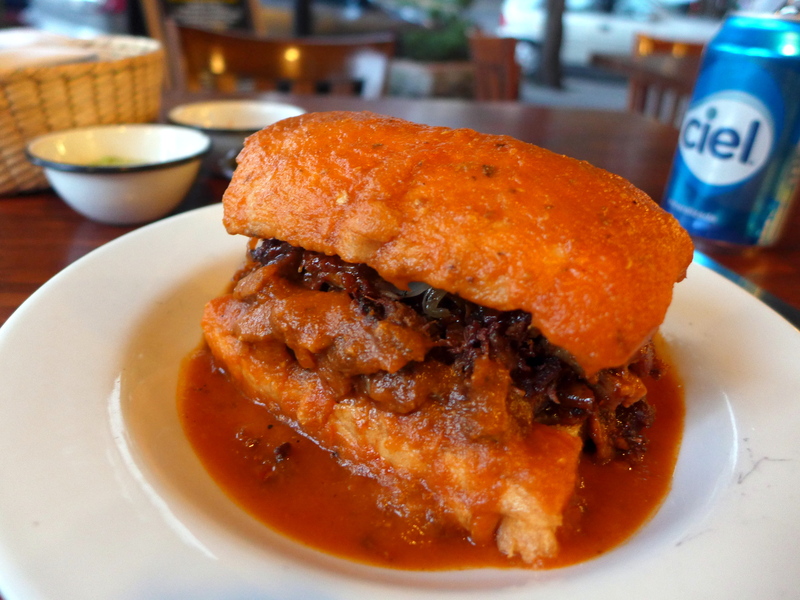 I had the Chile Con Carne (introduced in 1923) which was a rich, dark beef stew. It was delicious, but I had the distinct feeling the chef was holding back on the spices for the benefit of those who aren’t familiar with Mexican flavors. 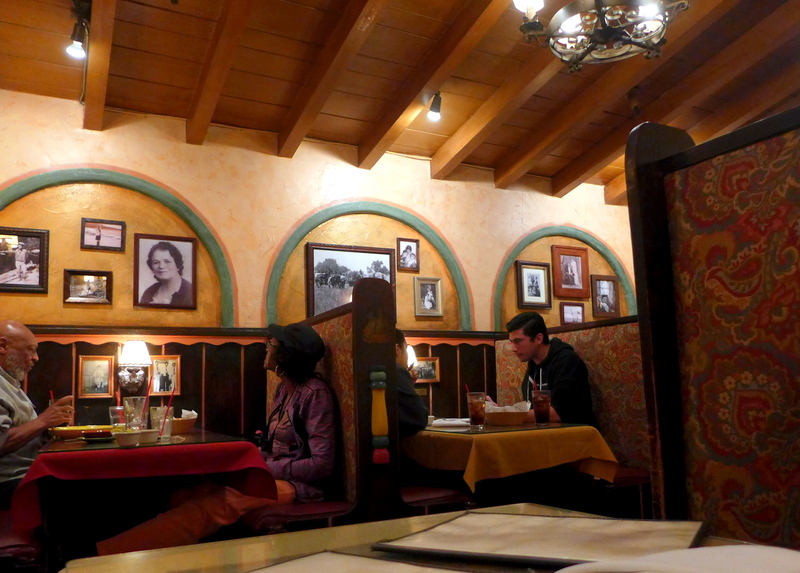 Don Antonio’s is a youngster compared with the other 2 restaurants, opening in 1981, but the founders’ history goes back a lot further with other restaurants around L.A. I went with a woman friend who observed that the last time she ate here was the night when her husband moved out of the house, some years ago. She ordered the Chicken Enchiladas, and declared that they are still the best comfort food she could possibly imagine. 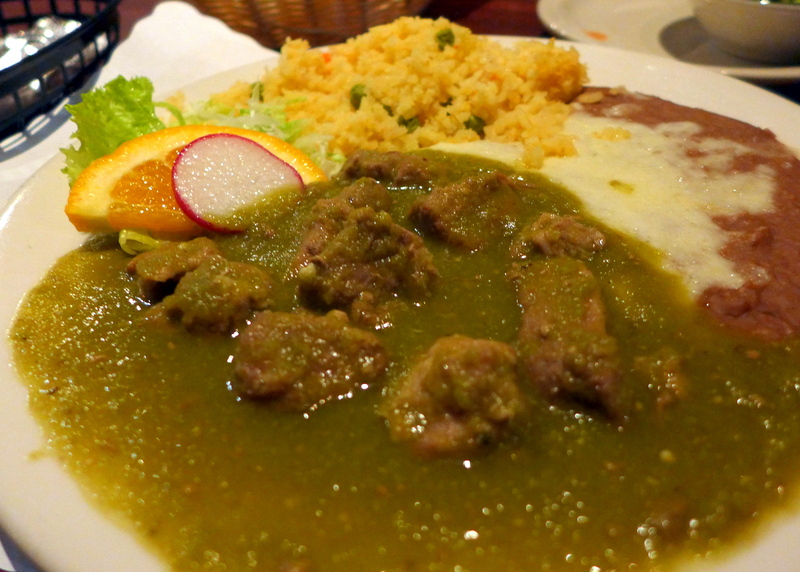 I had the Chile Verde, a dish I haven’t had in perhaps 25 years. The flavors were rich and meaty, and the portions generous. The main attraction at Don Antonio’s seemed to be the Fajitas. The room gradually became hazy from the smoke generated by the sizzling dishes coming out of the kitchen every few minutes. Maybe next time. These were 3 very good restaurants, serving Mexican food to Americans the same way they have for many years. They do what they do extremely well, and deserve their long run of success. 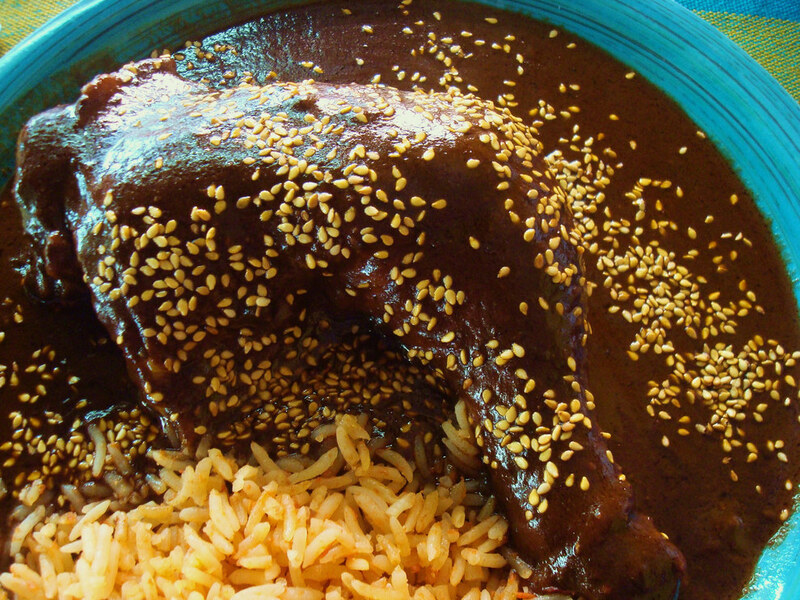 If you ask people in the city of Mexicali, Mexico, about their most notable regional cuisine, they won’t say street tacos or mole. They’ll say Chinese food. 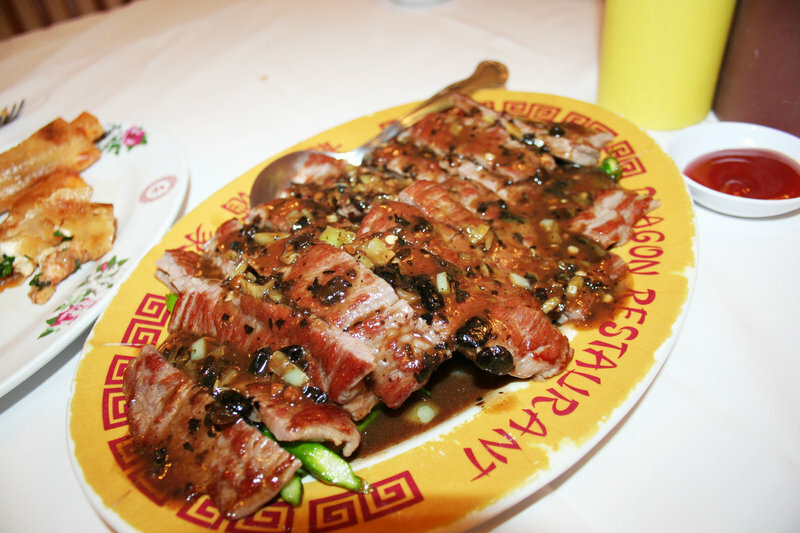 There are as many as 200 Chinese restaurants in the city. North of the border, in California’s rural Imperial County, the population is mostly Latino, but Chinese restaurants are packed. There are dishes in this region you won’t find anywhere else, and the history behind them goes back more than 130 years. The Salcedo family sits in a coveted booth at the Fortune Garden restaurant in the city of El Centro, north of the border. The mother and three adult sisters are almost drooling, waiting for their food to show up. 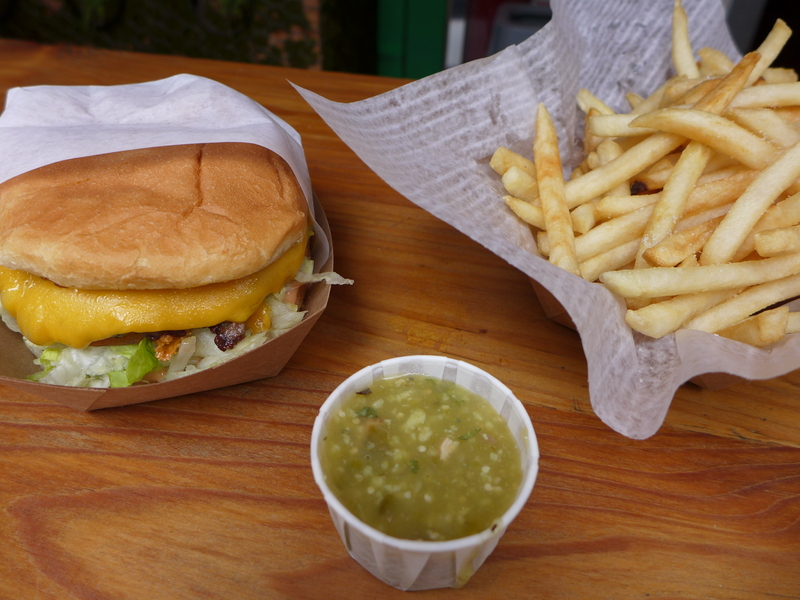 They come from Yuma, Ariz.— over an hour away — twice a month just to eat here. A huge side order arrives, light-yellow deep-fried chilis, a dish I’ve never seen. 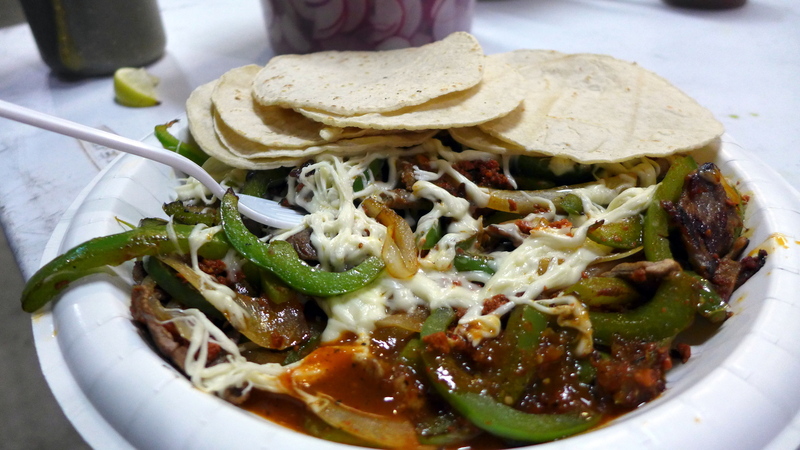 Then a salt-and-pepper fish, which the Salcedos describe as “Baja style,” with lots of bell peppers, chilis and onions. But have you ever heard of Baja-style dishes in a Chinese restaurant? “When they order, they don’t say barbecue pork,” says Fortune Garden co-owner Jenissa Zhou. 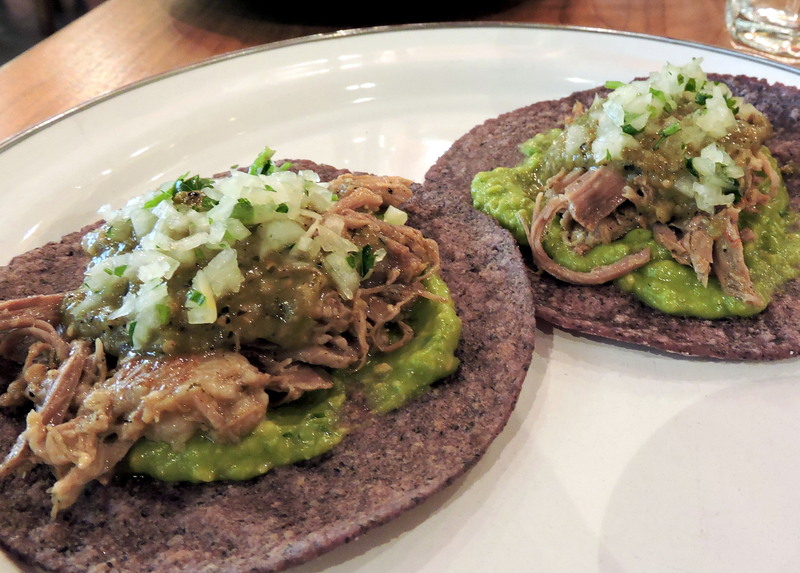 “They say carnitas — carnitas coloradas.” That’s “red pork” in Spanish. Zhou came to the U.S. from southern China. Her husband, Carlos, is from Mexicali, where he worked in Chinese restaurants. It took her a while to get used to her customers’ taste buds. 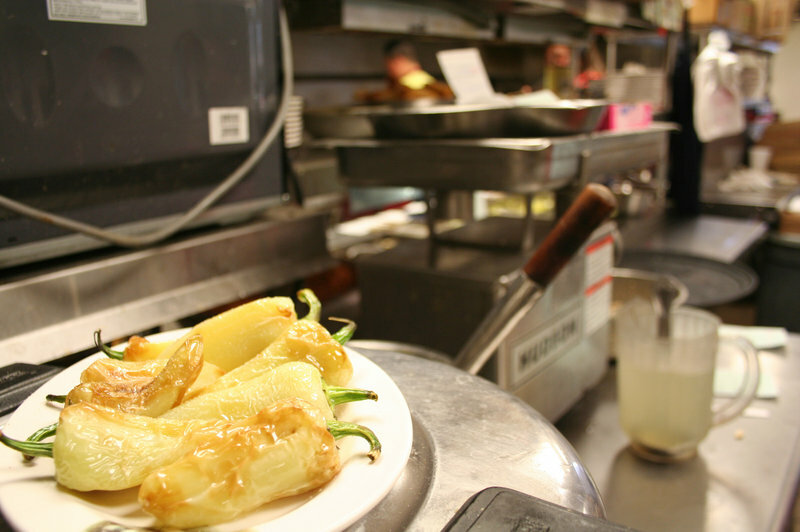 Those fried yellow chilis on almost every table, chiles asados, are served in a lemon sauce with lots of salt — kind of a margarita flavor. 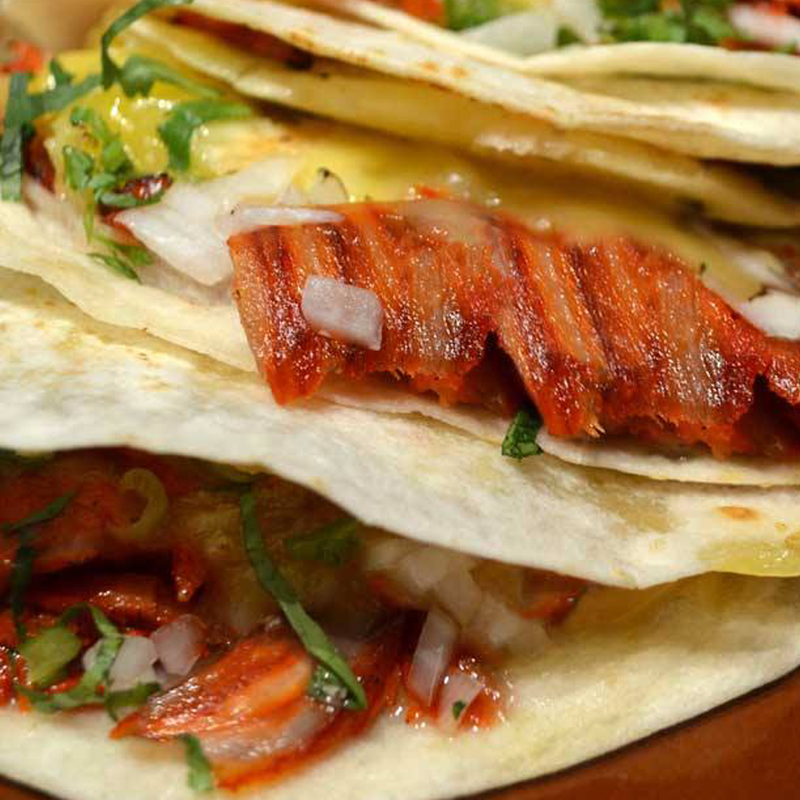 If you believe the rumors, some chefs marinate pork in tequila. 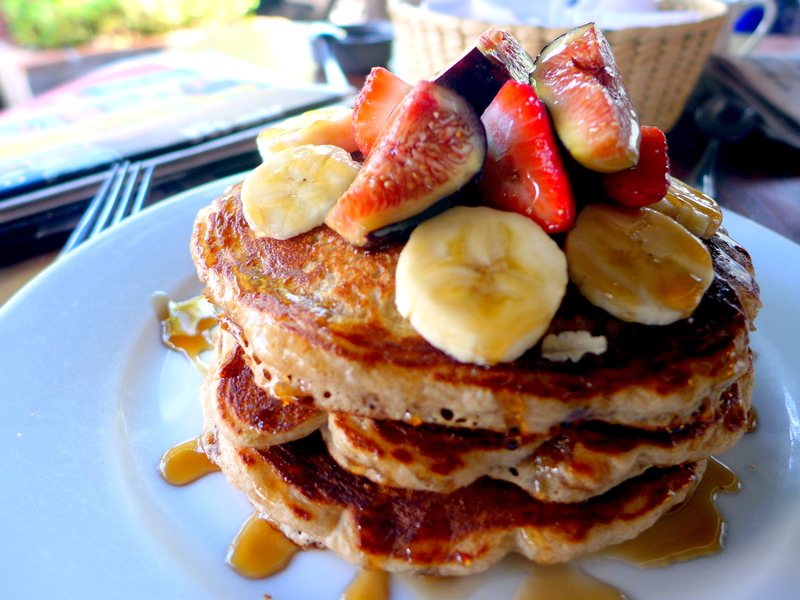 It’s not just on the plate where cultures combine. In the Fortune Garden kitchen, the cooks speak to each other in Cantonese. The waiters speak Spanish and English. “The restaurants you see now are remnants of the Chinese population that used to fill the U.S.-Mexico borderlands in Mexicali and in Baja California,” explains Robert Chao Romero, a professor at the University of California, Los Angeles. He teaches in both the Chicano and Asian-American studies departments and wrote the book The Chinese in Mexico. And just why were the Chinese there? Because of the Chinese Exclusion Act. Spurred by anti-Chinese laborer sentiment among American workers, the 1882 law banned immigrants from China from entering the U.S. Tens of thousands went to Cuba, South America and Mexico instead. 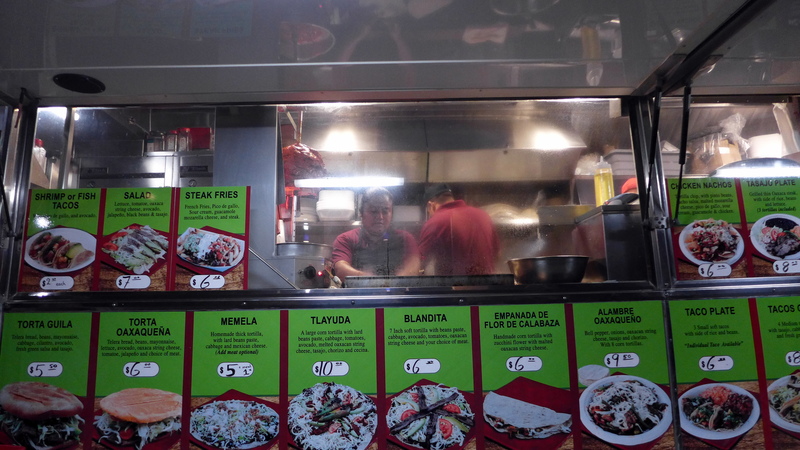 Many settled along the U.S.-Mexico border, becoming grocers, merchants and restaurant owners. Others managed to cross illegally and make lives in the U.S., including in Imperial County. Today’s Border Patrol grew out of the Mounted Guard of Chinese Inspectors, created to keep Chinese immigrants from entering the U.S. At the same time, the Mexican government welcomed Chinese immigrants to go to the sparsely populated border region, to work on farms and in mines and canals. The Chinese-Mexican cuisine this history begot is even more prominent on the Mexican side of the border, as I learn while taking a drive over the border with George Lim. He lives in the U.S. but commutes every day to Mexicali. Lim helps run one of the city’s oldest: El Dragon. Why cross the border every day to run a restaurant? Lim explains that Mexicali’s population is nearly 1 million, which dwarfs the rural population on the California side of the border. That sophistication may come from decades of people eating Mexican-influenced Chinese food here. 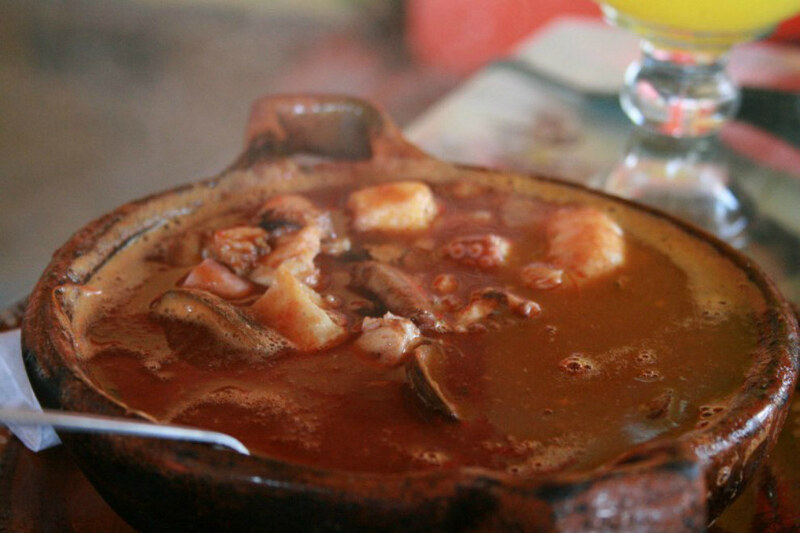 Once, it was a necessity: Chinese cooks used Mexican ingredients like chilis, jicama and certain cuts of meat, because that was what was available. Now it’s part of a culinary legacy. 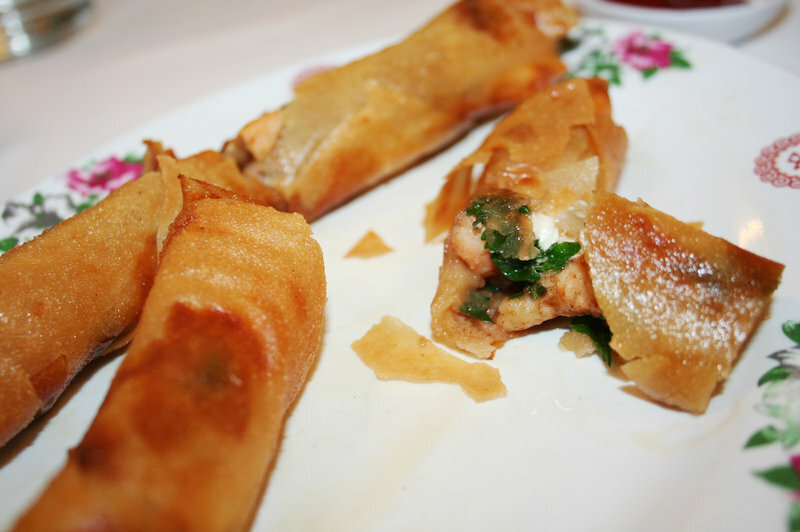 I try out a kind of Mexican-Chinese-American hybrid: an egg roll with shrimp, cilantro and cream cheese that seems like it shouldn’t be good, but is. And at El Dragon, they put avocado in the fried rice. Lim says people still come from China to work in Mexicali restaurants, and sometimes these cooks move up north, to work in Chinese kitchens in Imperial County. “One of the goals is to go to the U.S., have a better life for you and for your kids, give them a better education, better opportunity, maybe earning dollars instead of pesos,” he says. The same reasons, in other words, that drew their ancestors here from southern China 130 years ago. This story first ran on KQED’s The California Report. Vickie Ly helped with reporting and translation. The series “California Foodways” is supported in part by Cal Humanities. Lisa Morehouse, an independent journalist, produced this story during a fellowship at Hedgebrook, a residency for female writers. The section of Santa Monica Boulevard between Barrington and Bundy in West Los Angeles has become a focal point for really good Mexican food trucks. I am usually distracted by one or the other of the two trucks that regularly park between my apartment and Oaxaca on Wheels, so it has taken me a while to get to it. I was impressed by the range of uniquely Oaxacan dishes, and finally had a chance to try the exotically and mysteriously named Alambre. I was fascinated for years by Vampiros, until I finally ordered them in Mazatlan one evening, and leaned they were just tacos. Good tacos, but just tacos. My fear was that I would be disappointed by Alambres, another dish I’ve seen on Mexican menus for years, but never tried. Instead, it brought back a couple of nice memories. Some years ago, when I worked in the San Gabriel Valley in Southern California, we ate lunch at a favorite Chinese restaurant 2 or 3 times a week. It primarily catered to Chinese customers, and they were surprised but pleased that a group of young American men had become regulars. One reason we liked it of course, was that the pretty waitresses laughed at our jokes. Our favorite joke was giving American names to the distinctly Chinese menu items. If we ordered Chinese tacos, the knew exactly which dumplings we wanted. We also enjoyed the Chinese hamburgers and the Chinese spaghetti… You get the idea. As I was digging in to my beautiful plate of thinly sliced beef tasajo, green peppers, onions and chorizo covered in melted Oaxacan string cheese, I found myself thinking about the cheese steaks at Pat’s in Philadelphia. As I wrapped this delicious combination in rich, warm tortillas, I realized I was eating a Mexican Hoagie. The truck typically parks about a block east of Bundy, and has a loyal following. 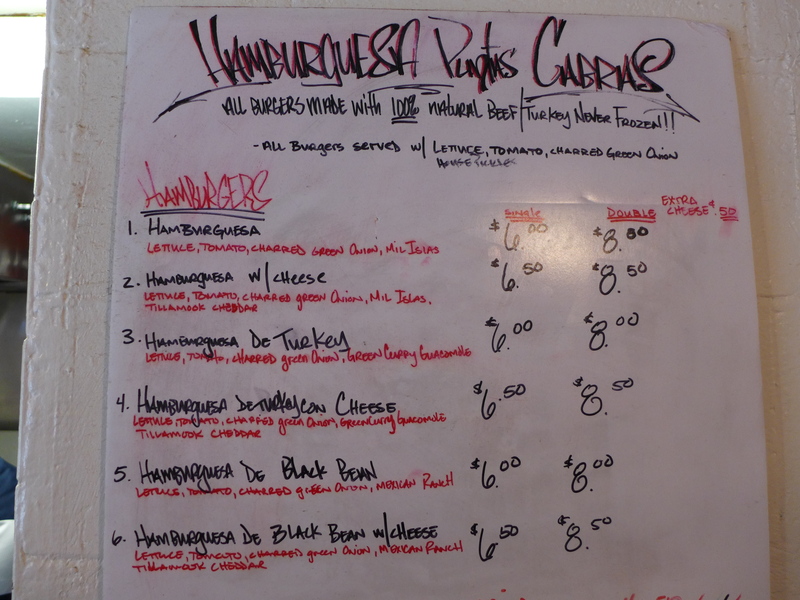 I know I’ll be going back to try more of their distinctive regionalMexican dishes.